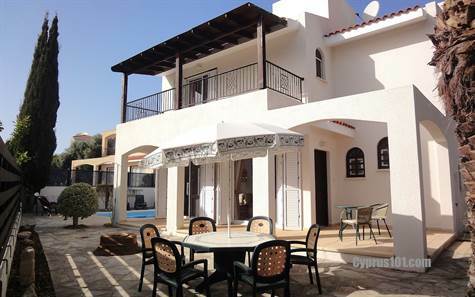 Coral Bay, Paphos - This impressive 3 bedroom detached villa is situated on a spacious plot in a quiet residential cul-de-sac in Coral Bay, one of the most popular areas of Paphos. The sandy beaches and wide variety of restaurants are within easy walking distance. The ground floor features a very spacious open plan living room, nicely arranged into a comfortable lounge, dining area and corner kitchen with breakfast bar. The kitchen is well equipped with built-in oven, electric hob and extractor fan, fridge/freezer and washing machine. There is a guest cloakroom near the staircase which leads up to three good size double bedrooms with fitted wardrobes and a family bathroom. The master bedroom has a wide private balcony with nice views of the surrounding area. The plot is a good size with a swimming pool and large terrace to the side. To the rear is a covered veranda running the length of the villa providing shade when required - ideal for outdoor dining and relaxing. The wide driveway easily caters for two to three cars and there is further on-street parking. In summary this property has huge appeal as a holiday retreat or permanent home. It comes fully furnished and title deeds are available.